After months of speculation and food-baiting, Jewel Changi Airport opens its doors today to its first wave of visitors in a series of public previews ahead of its opening on 17 April. Out of the 280 retail shops in the 10-storey lifestyle destination near Terminal 1, more than 100 of them are food and beverage outlets. 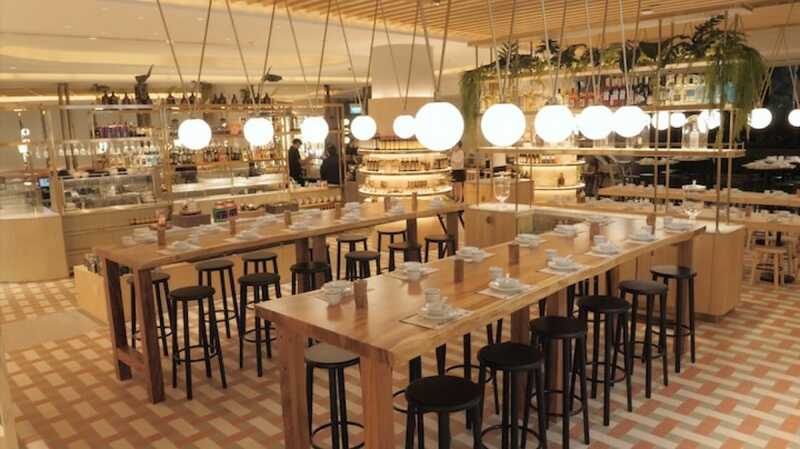 Adding pizzazz to the dining line-up, many home-grown and international food and beverage companies are presenting their best foot and food forward at Jewel by spinning off new food concepts and elevating the look and design of their shops. 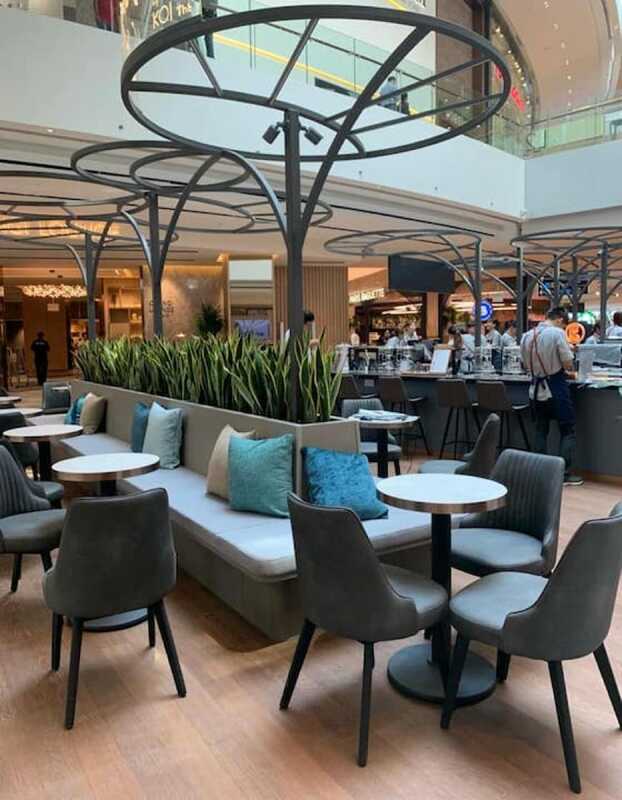 We suss out some eye-catching restaurant designs in the mall before the crowd descends. The casual Marketplace area in Shang Social is lit up with cool pendulum-like lights. Chinese cuisine need not be confined within the realms of round tables and lazy susans. Shang Social, a contemporary restaurant-bar-retail space, imagines Chinese cuisine through high tables, a showcase kitchen, plush booth seats, an ice-cream stand and a chic, light-filled cocktail bar. If you find the name familiar, it is because this is the first standalone concept by the Shangri-La Hotel Group. Tapping on the group’s growing presence in China and its stable of more than 100 Chinese chefs, the restaurant serves Cantonese, Huaiyang and Sichuan food. The 220-seat restaurant is divided into three sections. In the casual area, Marketplace, diners can tuck into dim sum and noodles as they observe chefs in action behind a theatre-like counter. In the more upmarket Dining area, there are plush peach-hued booth seats with chic hanging lamps. The bar, which serves bespoke cocktails with Chinese tapas, is lit up with light orbs on brass stands and exudes an old-world glamour of being in front of vanity mirror lights. 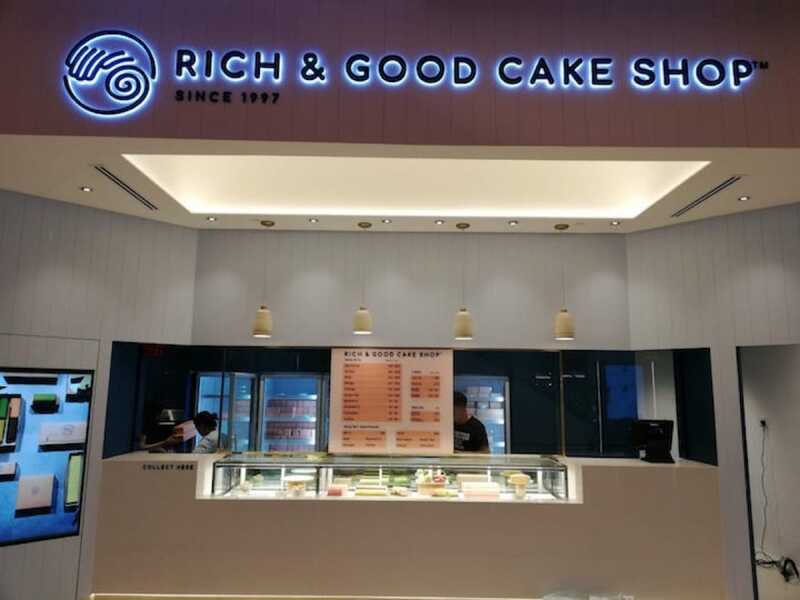 After decades of operating in its Kandahar Street shophouse unit, popular swiss roll shop Rich & Good Cake Shop makes its debut in a mall. The old-school cake house looks ready to take on the millennial generation — with its sleek gold-rimmed baby pink cake counter and LED screens showing flatlays of its cakes and the baking process. Expect 10 flavours of its famed soft and fluffy Swiss rolls in flavours such as red velvet, durian, kaya and green tea (from $9 each). The shop will also serve mini versions of its cakes (from $5 each). Taiwanese bubble tea chain KOI is serving more than just frothy shaken tea beverages. In its open-concept sit-down space, KOI Signature Bar offers a special tea brewing counter fitted with apparatus to concoct beverages made with high mountain tea leaves that are served with pastries. Home-grown confectionery chain Bengawan Solo goes for an upmarket look at its Jewel outlet, serving up its selection of kueh that is found in outlets island-wide. Gone are the no-frills shop design and in its place is a garden-themed interiors. Framing the cake display is a trellis that is adorned with orchids and a table decked out in kueh greets visitors at the door. There is even a demonstration counter where treats such as kueh lapis are rolled out a la minute. 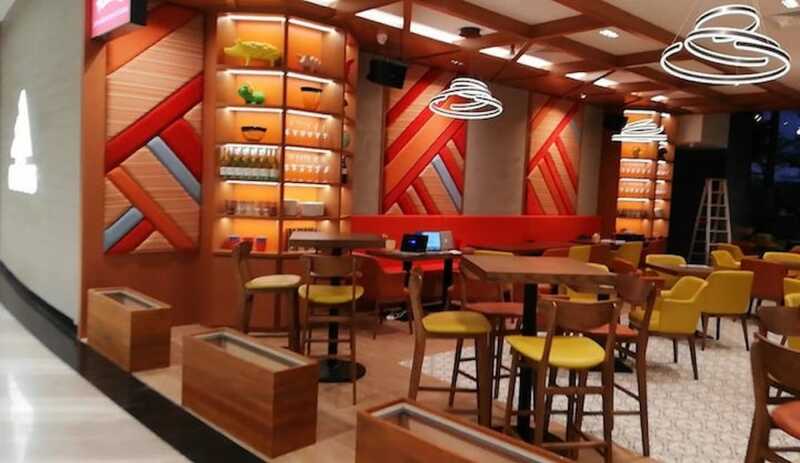 Tonito, a casual Latin American joint by Michelin Plate Spanish restaurant OLA Cocina Del Mar’s chef Daniel Chavez, is easily one of the most colourful restaurants in Jewel with upholstered wall panels in warm hues of brown, red and grey, and bright yellow and red seats. Splashes of colour in the form of quirky animal figurines deck the shelves. The menu is equally eye-catching with its array of Latin American sandwiches, skewers and light bites. Dishes include Pan Chon Chorizo (chorizo sandwich with sweet potato strips), Pan Con Chicharron (pork belly sandwich), anticucho skewers served with chimichurri, and tacos and quesadillas. American coffee chain Starbucks has opened its flagship and largest shop in Singapore that feature handcrafted coffee-themed art pieces, two bars, coffee seminar areas and an art gallery. Visitors cannot miss the beautifully layered wooden storefront that is fashioned after the textures of the landscape of a coffee farm landscapes, while its coffee bar is shaped like a coffee bean that is carved with honeycomb patterns. The outlet also pays homage to Singapore culture with a towering art piece that bears the word “Singapore” that is formed by Peranakan-inspired tiles. The outlet also has a Reserve Experience Bar, where coffee is brewed manually in ways such as pour over and siphon brew. Singapore cooking doyenne Violet Oon has unveiled her fifth and largest Violet Oon Singapore outlet that is a culmination of her four other restaurant concepts in Singapore that include a grill menu and colonial Hainanese dishes, on top of the usual Peranakan and Singapore dishes. The restaurant looks stunning with a visually-impressive emerald green counter that is lit up with old-school hanging lamps. There is also an extended retail corner that stocks kaya spread, cookies, candies and pineapple tarts. Perfect that those on the prowl for food souvenirs. Collin's is known for its wallet-friendly casual Western food concept in shopping malls and coffee shops. However, the chain has spruced up its look for its latest outfit in Jewel Changi Airport. 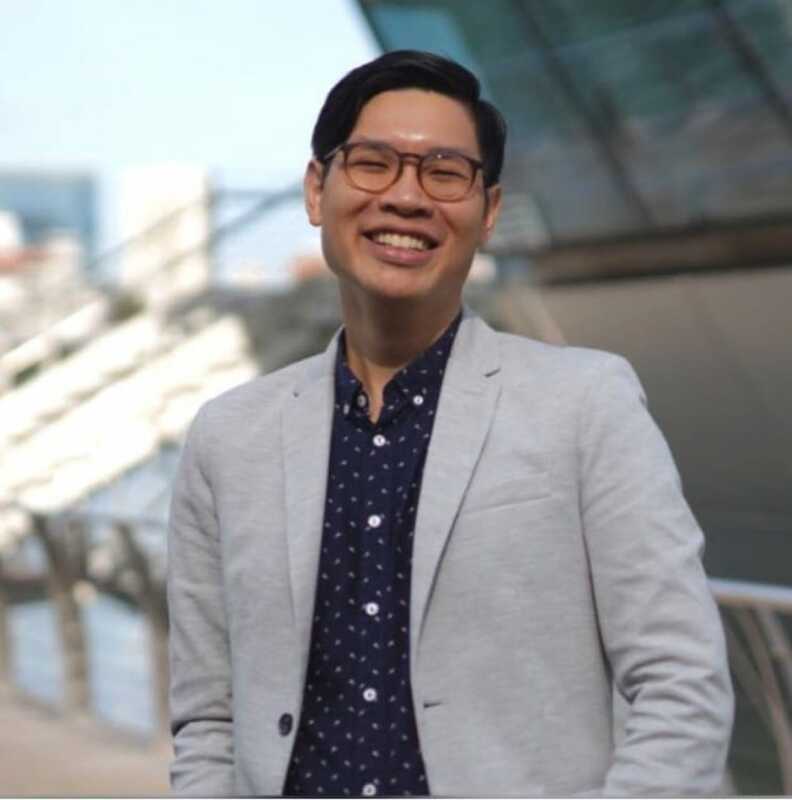 It is collaborating with up-and-coming chef Koh Han Jie, who was a chef de partie at two-Michelin-starred Les Amis Restaurant and veteran chef Edmund Toh for its first contemporary European restaurant.